Researchers have identified a drug that can regenerate teeth from the inside out, possibly reducing the need for artificial fillings. The drug was previously used in Alzheimer’s clinical trials, and it now appears to improve the tooth’s natural ability to heal itself. It works by activating stem cells inside the tooth's pulp centre, prompting the damaged area to regenerate the hard dentin material that makes up the majority of a tooth. "The simplicity of our approach makes it ideal as a clinical dental product for the natural treatment of large cavities, by providing both pulp protection and restoring dentine," said lead authorPaul Sharpe from King’s College London. "In addition, using a drug that has already been tested in clinical trials for Alzheimer’s disease provides a real opportunity to get this dental treatment quickly into clinics." After a tooth is damaged by things like trauma or cavities, the soft pulp at its centre can be exposed, increasing the risk of infection. To prevent that, our bodies create a thinlayer of dentin - the hard, calcified tissue that makes up the bulk of a tooth - which helps block outside material from making its way inside. But this process is not enough to stop large cavities from exposing the vulnerable pulp, which is why dentists drill out the cavity, and then pack the area with artificial fillings - a treatment that's worked in the past, but isn’t ideal. "The tooth is not just a lump of mineral, it’s got its own physiology. You’re replacing a living tissue with an inert cement," Sharpe told Hannah Devlin at The Guardian. 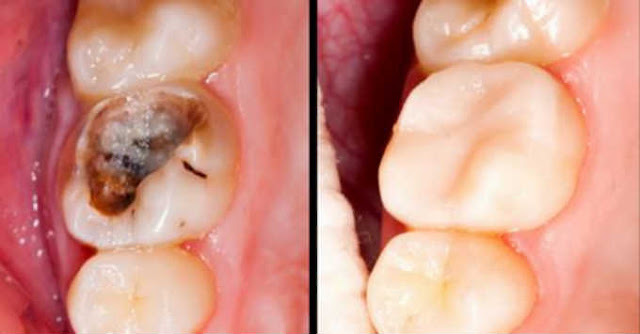 "Fillings work fine, but if the tooth can repair itself, surely [that’s] the best way. You’re restoring all the vitality of the tooth." Sharpe and his team found that they could use the Alzheimer's drug Tideglusib to stimulate the stem cells inside a tooth to actually create more dentin than usual, regenerating the whole structure without needing to add any foreign substance at all. In other words, no fillings. To figure this out, the researchers used Tideglusib on damaged teeth in mice to see how it promoted stem cell activation. The drug was applied to the cavity using a biodegradable collagen sponge soaked in Tideglusib molecules, and then everything was sealed up inside. After several weeks, the team saw that the collagen sponge had degraded, and the teeth had regenerated enough dentin to fill the gap. The process itself is very similar to a normal cavity filling, but instead of putting in an artificial filler, doctors are encouraging the growth of natural dentin, leading to healthier teeth in the long run. "Dentistry is not only about filling and drilling, but also about keeping the teeth healthy," oral cell biologist Ben Scheven from the University of Birmingham in the UK, who was not involved with the study, told The Guardian. "Especially since it’s an accessible and cheap treatment, I can imagine this being used in the clinic." Considering the technique has so far only been tested in mice, there's a lot more research to be done to confirm if the results can be replicated in humans, so we can't get ahead of ourselves just yet. The team plan on moving to rats next, and if those results are positive, human trials could be on the cards. The good news is that Tideglusib and the collagen sponges used in the procedure have both passed clinical trials for other treatments, which will likely speed up the process if the technique does make it to human testing. This isn't the only effort to improve how we perform fillings - in 2015, another team in the UK announced that they're developing a 'pulp cap' that can be inserted in a tooth to stimulate stem cells and trigger similar dentin growth. And another study from 2015, this time by researchers in Australia, found that tooth decay could be reversed with a high-concentration fluoride varnish before cavities form, possibly lowering the amount of treatment needed to begin with. We still have a long way to go before these options will be available at our local dentist, but researchers are determined to make oral care less horrible in the future, which should be good news tomillions of people who fear the drill. The study was published in ScientificReports. This post was republished from sciencealert.com. You can find the original post here.